The Alternating Current Field Measurement (ACFM ) technique is now widely used in the Oil and Gas Industry for in service inspection. 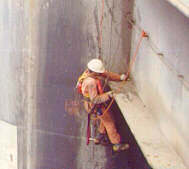 The technique is routinely used both sub-sea and topside for structural weld inspection and is capable of both detecting and sizing surface breaking cracks. PETROBRAS, the Brazilian State Oil Company, has recently introduced ACFM inspection as part of their routine structural inspection programmes for their offshore platforms. This has produced excellent results during both laboratory tests and experimental field services, carried out during the past 2 years in Brazil. The main field application of the technique has been underwater inspection of structural welds on both fixed and floating offshore platforms. Compared to conventional inspection methods, employing Magnetic Particle Inspection (MPI), the use of ACFM has resulted in substantial cost savings allied with improvements in inspection reliability. When introducing a new inspection technique, it is necessary to consider many aspects and to evaluate the capabilities of the technique in the laboratory prior to implementation offshore. It is also necessary to properly consider the development and evaluation of appropriate inspection procedures and the training of personnel. This paper describes the ACFM method and how it has been applied to subsea structural weld inspection in Brazil. It also considers the requirements for introducing new inspection technology into a major Oil Company and the need for cross comparison with existing inspection methods. The requirements for the development of operator training and certification schemes are also considered and the approach adopted by PETROBRAS to these challenges explained. Finally the results from inspections of a number of fixed and floating offshore platforms are presented, which show cost savings of approximately $1,500,000 over a two-year period compared to conventional MPI. PETROBRAS are planning an increase in Brazilian oil production and much of this is focussed on their offshore oil reserves. The Brazilian coastline is in excess of 8000 kilometres and PETROBRAS now operate more than 100 offshore platforms, 25% of which are mobile (floating) structures. Offshore platforms operate in a harsh environment and are subjected to a variety of cyclic loads due to wind and waves. This can in some cases lead to degradation due to fatigue. In order to ensure the reliability of the offshore operations it is necessary to monitor the condition of the structures to ensure that structural integrity is being maintained. To achieve this, and in the case of mobile platforms, to comply with Classification Society Rules and Regulations, routine structural inspections are carried out. Conventional inspection methods, such as Magnetic Particle Inspection (MPI) can account for more than 50% of the total inspection costs. When applied underwater, the cost of MPI can increase significantly due to high levels of cleaning required and due to constraints on conducting the inspecting due to the sea state, currents and visibility. TSC Inspection Systems, a UK Company, has developed an inspection method called ACFM (Alternating Current Field Measurement) which can be used as an alternative to MPI. ACFM equipment has been developed specifically for subsea inspection and is widely used around the world for the inspection of offshore platforms. PETROBRAS were first made aware of the ACFM technique at an NDT Congress in 1994 and recognised the potential advantages both in terms of the technique itself and the potential cost savings. PETROBRAS then embarked on a process of research and evaluation to first assess the capabilities of the ACFM technique and to explore the way in which it could be incorporated into their offshore inspection activities. These studies were conducted by its Research Centre and with the Exploration and Production Department and assessed the capabilities of the ACFM technique for offshore structure inspection (topside and subsea) and also for industrial pressure vessel inspection. Fig 1: Flow of current around a surface breaking crack and ACFM signals obtained. 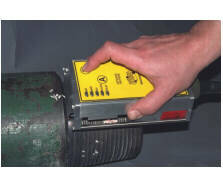 The ACFM method is an electromagnetic inspection technique which can be used to detect and size surface breaking (or in some cases near surface) defects in both magnetic and non-magnetic materials. ACFM is a current perturbation technique and is fundamentally different to conventional eddy current techniques. When an alternating current flows in a conductor it flows in a "skin" following the surface. If a surface breaking crack is present, this otherwise uniform sheet of current is disturbed. There is a magnetic field associated with this electrical field and the magnetic field disturbances (associated with the electrical current disturbances) can be measured using magnetic field sensors. Although the resulting magnetic field is complex, components can be chosen, which allow disturbances due to cracks to be identified and quantified. Figure 1 shows how the electrical field is disturbed on the surface by the presence of a crack. In practice, two components of the magnetic field are measured, Bx along the length of the defect, which responds to changes in surface current density and gives an indication of crack depth and Bz, which gives a negative and positive response at either end of the defect, caused by current generated poles, and thus gives an indication of length. In standard applications two field sensors are used and these are incorporated into a probe head which also introduces the uniform current into the component using a field inducer. The probe does not require any special scanning patterns. In order to inspect for weld toe cracks, the probe is simply moved along the weld toe. Since the signals produced in the sensors were extremely small, TSC have developed an instrument generally referred to as the Crack Microgauge, which controls the inducing field and amplifies and digitises the sensor readings. All functions are under the control of an onboard microprocessor, which sends data to a standard laptop PC. Specialist Windows software is used to control the inspection and display and store the results. Figure 2 shows a typical ACFM data display produced when the probe is scanned over a defect. In the left-hand side of the screen, the Bx and Bz readings are plotted. A defect is indicated by a trough in the Bx plot, the deepest point coinciding with the deepest part of the crack, associated with a peak and trough in the Bz plot, which indicates the location of the crack ends. To aid in interpretation, the Bx and Bz readings are plotted against each other on the right hand side of the screen where a characteristic loop is formed in the presence of a defect. This display, called the "butterfly plot", is unique to ACFM and, because it is insensitive to probe speed, greatly enhances interpretation. Once a defect is identified the depth can be determined by entering the length of the defect, found by marking the locations of the Bz peak and trough on the sample, and choosing two points from the Bx trace. The software algorithms instantly return a value for crack length and depth, which is displayed above the defect indication on the screen. A laptop PC which acts as system controller. This controls all of the functions of the system and provides the data display. All data is also stored in the PC. The topside unit provides the interface between the subsea unit and the PC. The subsea unit is powered by 110V from the surface and the topside unit also provides safety cut out to protect the diver. The subsea unit is a pressure housing containing the system electronics and is connected to the topside unit via a special umbilical. 350m umbilical which carries power and communications between the topside and subsea units. Inspection probes which are connected to the subsea unit using underwater mateable connectors. 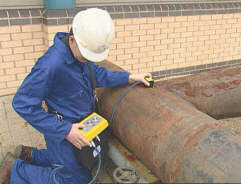 Inspections are carried out by scanning the chosen probe along the weld toes. Long welds are inspected using a series of overlapping scans (to ensure full coverage). Scanning speeds of approximately 10mm / second are used. The data is displayed and stored on the PC controller and can, if required, be replayed. The probe operator (diver) Figure 4 has no data display and is not an inspection specialist. The inspector generally watches the real time display as the probe is scanned and looks for the characteristic defect signals. Data can be replayed at any time and this allows data to be reviewed / audited, even at a different site by copying the data onto a diskette or transferring via Email. As with any inspection technique, it is important that inspectors are properly trained and certified. Training and certification for ACFM operators is available under Lloyds, CSWIP and PCN schemes. PETROBRAS initially sent four engineers to the UK for training and these have achieved certification to CSWIP Level 2. PETROBRAS are now implementing a Brazilian Certification Scheme for ACFM operators, which provides for Level 1, 2 and 3 certification. TSC and TWI are assisting in the process and it is expected that PETROBRAS will issue the first Level 3 certificates for ACFM operators during 2000. ACFM requires less surface preparation. It can be used on coated or rusted surfaces without coating removal or cleaning to bright metal. In most cases light brushing is sufficient. ACFM can be used on non-conducting coatings, in good condition, up to 5mm thick. ACFM can be deployed in most sea conditions and, unlike MPI, is not limited by currents, swell or poor visibility. ACFM can be used in any light level and can therefore be used in 24 hour operations. ACFM provides information on defect length and depth. ACFM is faster to deploy. ACFM provides electronic records of all inspection data which is available for subsequent review or audit. Use of a two man team means the probe can be deployed by diver or abseiler who is not a skilled ACFM operator. 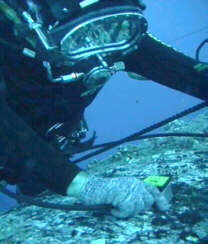 Data analysis is conducted by a skilled operator who is not required to dive or climb. High capital cost of equipment compared to MPI. Operator requires a higher level of training and to possess knowledge of computer operation and welding as well as NDT. Sensitivity to shallow cracks is less than MPI in some situations. Equipment is less portable than MPI. Complex signals can arise from tight geometries, plate edges and branched cracks. The underwater ACFM equipment purchased by PETROBRAS has been in regular use since 1997 for structural inspection of offshore platforms. 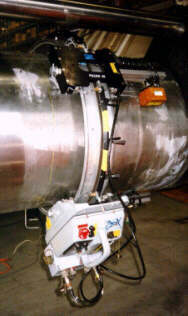 In 1999 trials were also conducted on the use of ACFM to inspect industrial pressure vessels. Some of the ACFM inspections conducted by PETROBRAS are detailed below. These provide an indication of the amount and type of inspections conducted and the cost savings achieved in using ACFM rather than conventional MPI. Structural welds on 7 fixed offshore platforms were inspected using ACFM. These platforms were located in the Northeast state of Rio Grande do Norte and the welds were located in water depths ranging between 7m and 30m. A total of 25 structural welds were inspected. The diving was carried out from the platform, rather than a dive boat, and involved a 6 man dive team. The divers used for probe handling had four hours training in the scanning of ACFM probes and in communication with the ACFM inspection technician who was located on the platform deck. Some cracks were found during the inspection. The cost saving compared to using underwater MPI inspection was estimated at US$45,000. PETROBRAS V is a jackup platform and was docked in SUAPE harbour in the state of Pernambuco. Inspections were carried out on selected areas of the spudcans and legs. Some of the leg welds were out of the water, some were beneath the surface. In order to provide confirmatory information, all cracks detected by ACFM were re-inspected using MPI and in all cases location and crack length determined by ACFM was confirmed by MPI. On the underwater welds, it took three attempts to confirm with MPI, even though the location of the cracks had been established by ACFM. This difficulty with MPI arose because of the poor visibility due to muddy water in the harbour. 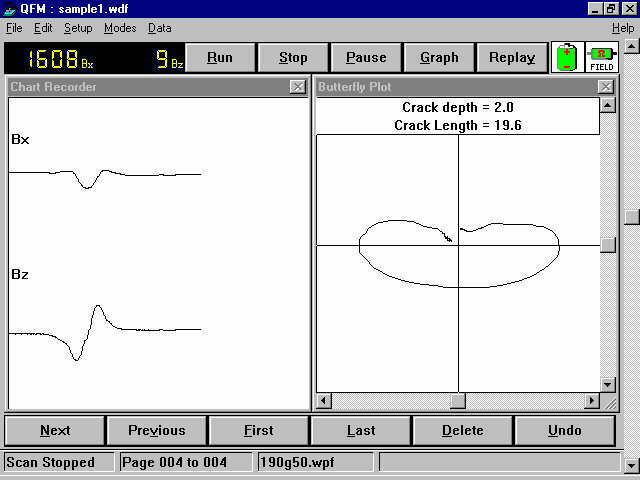 In addition to crack detection, cracks found were also sized using ACFM to detect their length and depth. Obviously MPI could not confirm the depth and so grinding was carried out to remove the crack and again this process confirmed the depth measurement provided by ACFM. The use of ACFM reduced the docking time by two days and resulted in cost savings of US$100,000. Inspections were carried out on 8 fixed offshore platforms in the Northeast state of Ceara. A total of 59 welds were selected for inspection in water depths up to 42 metres. In this operation, all diving was carried out from the deck of a supply boat, which provided very good access to the inspection sites and easy deployment of the equipment. Some bad weather was experienced and the severe motions of the supply boat led to a failure in the topside unit. This was subsequently repaired. The average time for preparation and inspection of node weld at 40 metre water depth was twenty minutes, this is approximately four times faster than MPI. Cost savings on this operation were estimated at US$250,000 compared to MPI inspection. For the past three years, ACFM has been used for the inspection of selected structural welds on a fixed and floating (semi submersible) platform located in the Campos Basin. Excellent results have been achieved and the estimated saving compared to MPI is US$1,500,000. 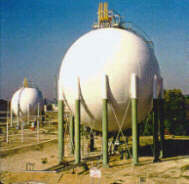 Gas Storage spheres (Figure 5) are routinely used in industrial applications. ACFM was used for the inspection of selected areas of three spheres located in Aracaju. The selected welds had been previously inspected using MPI. The ACFM inspections were carried out using the underwater equipment. This led to overheating due to the high internal temperature in the sphere (34oC) which resulted in the equipment shutting down on occasions. ACFM equipment is available for topside use but at the time of the inspections, PETROBRAS did not have any available. These inspections allowed direct comparison, in terms of timing and performance, with MPI. ACFM found two crack like indications, only one of which was confirmed by MPI. The MPI inspection took three times longer than ACFM excluding report writing. When writing up of the MPI report was taken into account, the savings using ACFM were even greater. Portable, lightweight equipment is available for above water inspection. The latest generation of battery powered ACFM equipment is called the AMIGO (Figure 6). This weighs only 41/2 kg and has a battery life of ten hours. This equipment is ideally suited to sphere inspection. The underwater inspection carried out by PETROBRAS made use of a diver to deploy the probe with the inspection specialist operating the PC. The same approach is used topside but this time using climbers (abseilers) to deploy the probes, Figure 7. This approach is used in other parts of the world for the inspection of offshore platforms topside, storage spheres, cranes and bridges. PETROBRAS inspection contractors have started to introduce rope access methods into the region and PETROBRAS have now purchased ACFM topside equipment as well. Topside inspection offers more challenges than subsea in terms of the range of geometries and material encountered. To meet these demands, a number of special probes have been developed which allow better access to tight geometries and reduced response for geometric features such as plate edges and attachments. These combined with new high frequency options allow the inspection of both carbon steel and non magnetic materials in a wide range of industrial configurations. All of the above examples have been of manual weld inspection. These are typical of ACFM operations around the world. In some cases, it is desirable to include some automation into the inspection process, especially if there are individual components to be inspected. More complex ACFM probes are available containing multiple inspection sensors. These are known as ACFM arrays and allow larger areas to be inspected in a single scan. These can also be fitted with position encoding to allow a complete record of the distance travelled and the exact location of defects found. Examples of such systems developed for the Oil Industry are an automated system for the inspection of titanium drilling risers (developed for Statoil in Norway) Figure 8, and a Drillstring Thread Inspection system, Figure 9, now being used in the North Sea to improve drillstring inspection reliability. From the results of the subsea inspection evaluation conducted with ACFM, and reported in this paper, it is reasonable to predict that ACFM will replace MPI for all underwater structural weld inspection on PETROBRAS Offshore platforms. The training and certification of ACFM operators is now being implemented within the PETROBRAS Certification Scheme and specific procedures will be developed to ensure that the benefits achieved to date are maintained in the future. For topside inspection, the results have been extremely encouraging and it is considered likely that ACFM will now be introduced into PETROBRAS activities both on platform topside and in the refineries they operate. Smith, M. "Underwater ACFM - Inspection Procedure", Technical Software Consultants Limited, September 1995. Martins, M.V.M. "Procedimento para Operacão do Detector de Trincas U21, de Fabricacão de Firma Technical Software Consultants Limited, utilizando o programa WAMI 4 x" - PETROBRAS, junho, 1998. Fernandes, J., et all "Relatório de inspecão com ACFM no E&P-RNCE" - PETROBRAS, novembro, 1998. Martins, M.V.M., Marques, F.C.R. "Inspecão em soldas estruturais da platforma PETROBRAS-V (PA-16) com a técnica ACFM" - Comunicacão Técnica SEMEC 042/99 - PETROBRAS, marco 1999. Marques, F.C.R. "Inspecão Estrutural Submarina por ACFM nas Plataformas Marítimas do Caerá", PETROBRAS, maio 1999.